Ten years ago, building an engine for an offshore boat was hands-down the most demanding build you’d ever come across. 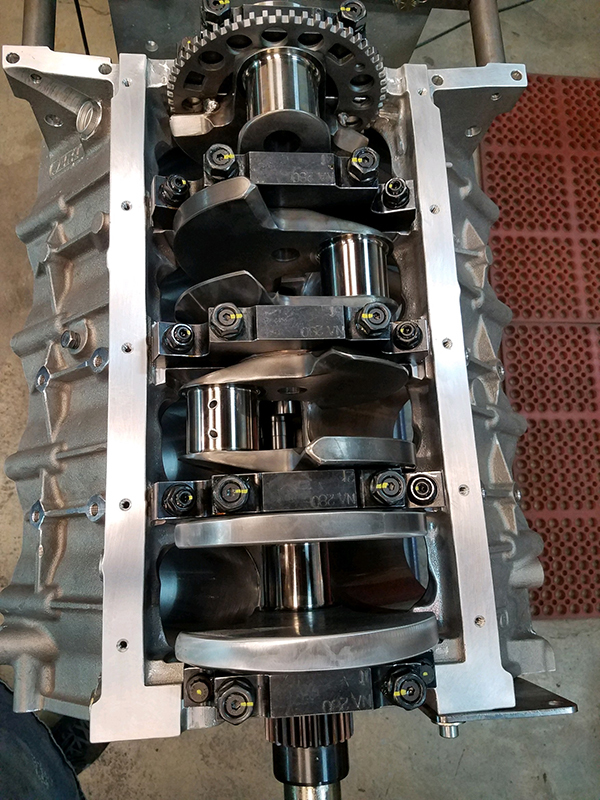 The boat’s combination of weight and size and the bouncing over waves causing the props to lunge in and out of the ocean or lake makes an offshore engine one tough customer. However, today, the toughest engine application is off-road racing – otherwise known as Trophy Trucks. 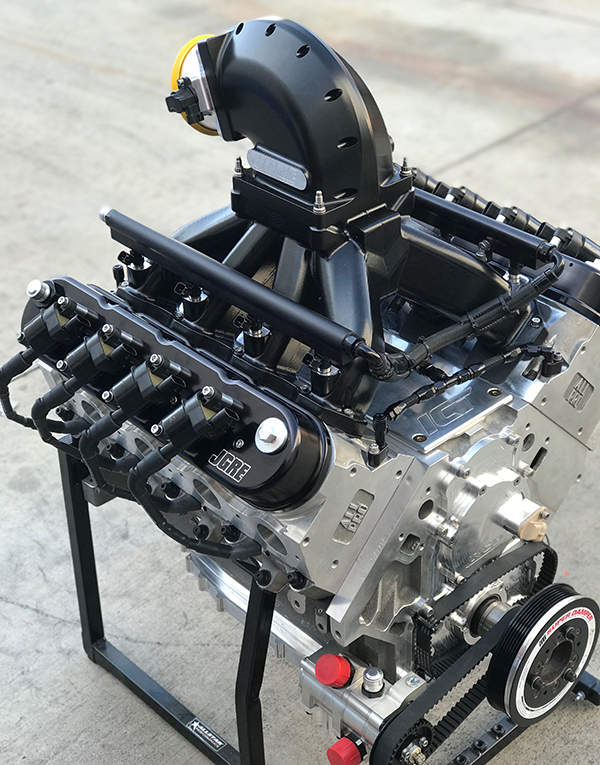 It’s these kinds of endurance engines that Jeff Ginter, owner of Jeff Ginter Racing Engines, specializes in. “Whether it’s us or anybody else that builds engines in this venue, if you can build an engine to live and to last in this environment, you’ve got things pretty well figured out,” Ginter says. Those off-road vehicles are heavy and they push 800-900 horsepower engines with 38-40-inch tires all while going over washboard roads with ruts that are four feet deep and can last for a 30-40 mile stretch. And that’s not even usually the worst of it. Jeff Ginter has been a Southern California man most of his life, and having been raised around racing, dirt bikes, Bell Auto Parts, the Weiands, Edelbrocks and Iskenderians, and having trips to Lions Drag Strip, Pomona and Irwindale at a young age, he was destined to end up in the engine building industry. Those influences led Ginter to jobs at companies such as Speed-O-Motive, SC Performance Wholesale, LA Enterprises and JE Pistons. 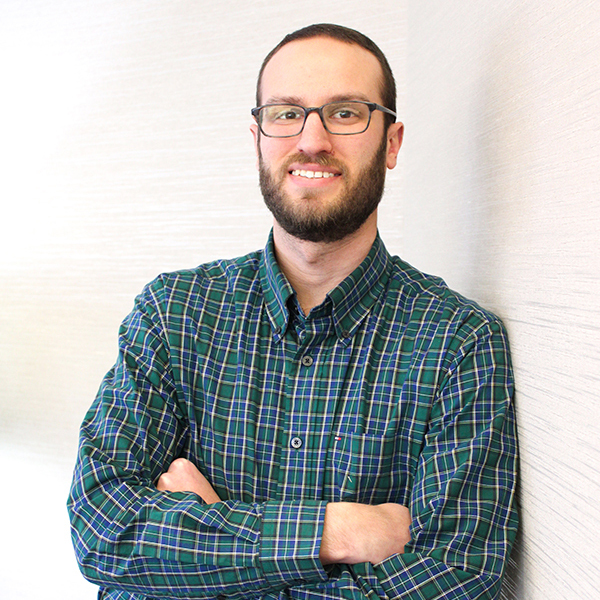 “I’ve always been more on the hard parts side of the industry – the designing of products – whether it’s the designing of crankshafts, the design of connecting rods, the tooling, the fixturing, the programming,” he says. 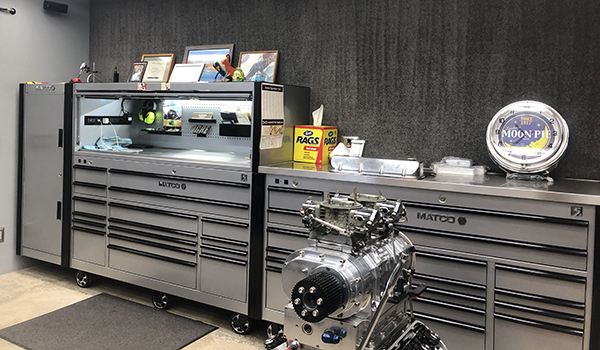 “For me, building engines and then having a design and manufacturing background, it was always very simple because I could go back to the drag races or I could go back to the NASCAR teams and I could sit down and talk to these guys or go into the engine shops. If they had ideas or things they wanted to do or things they wanted to try, I could easily visualize how we could do it on the machine, how we can program and how we can retool. Ginter left the corporate side of the industry after JE was sold. That’s when he opened a high-end pneumatic air tool business catering to large aerospace companies. 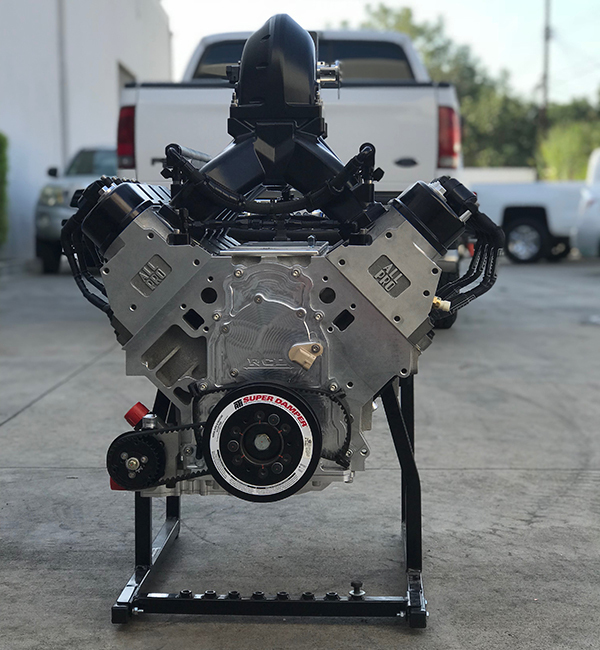 However, about three years ago, he had a customer contact him about building an engine for an off-road racing team, and Jeff Ginter Racing Engines (JGRE) was born. 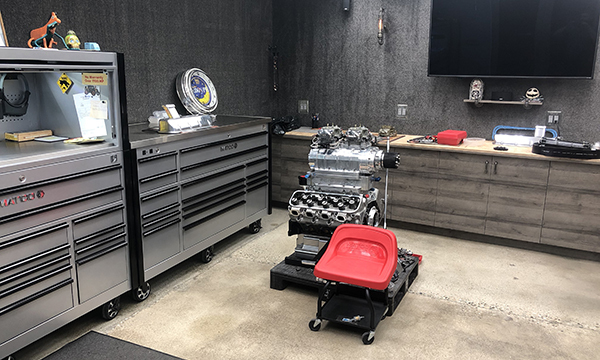 The Artesia, CA-based shop has three full-time employees and just finished adding 1,500 sq.-ft. of space to the 6,500 sq.-ft. facility to make room for more machinery. 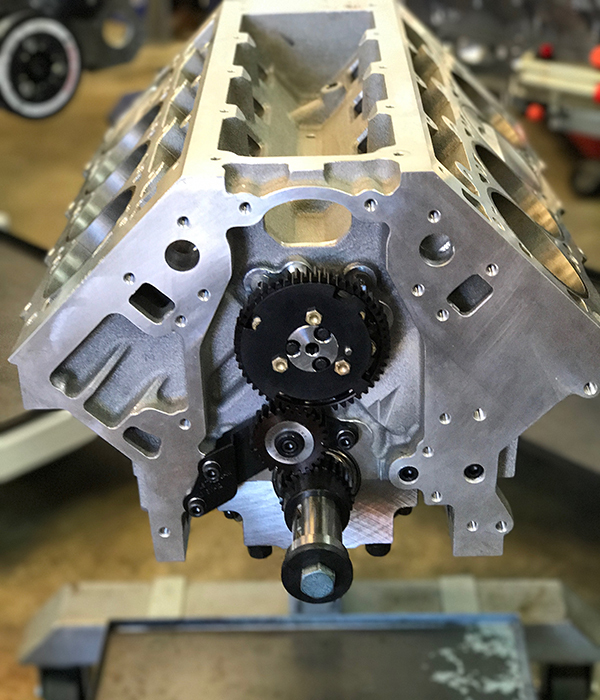 Due to not having all of the necessary equipment, JGRE does all of it’s own assembly work, but only some of the machining processes. The bulk of the engines that JGRE does are LS-based engines. 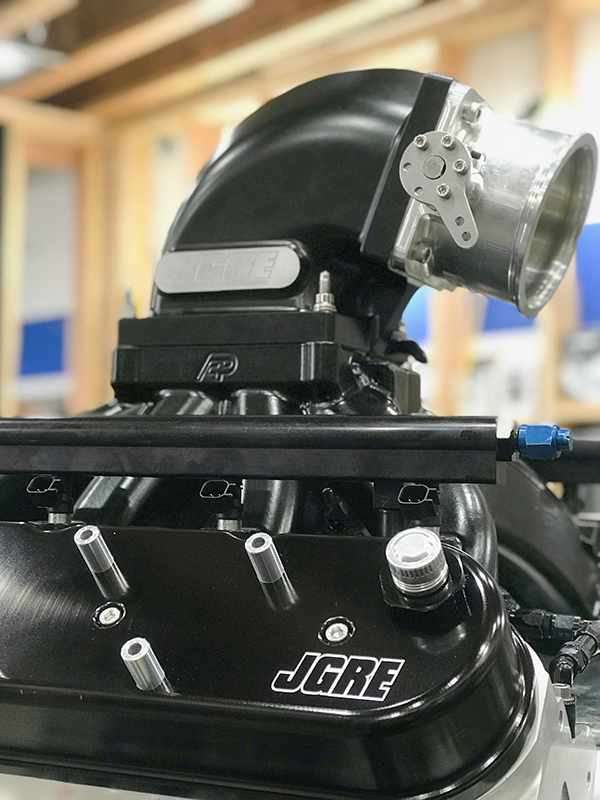 The platform has become a very, very popular engine not only for desert racing, but for marine and four-wheel-drive applications as well, all of which JGRE tends to. 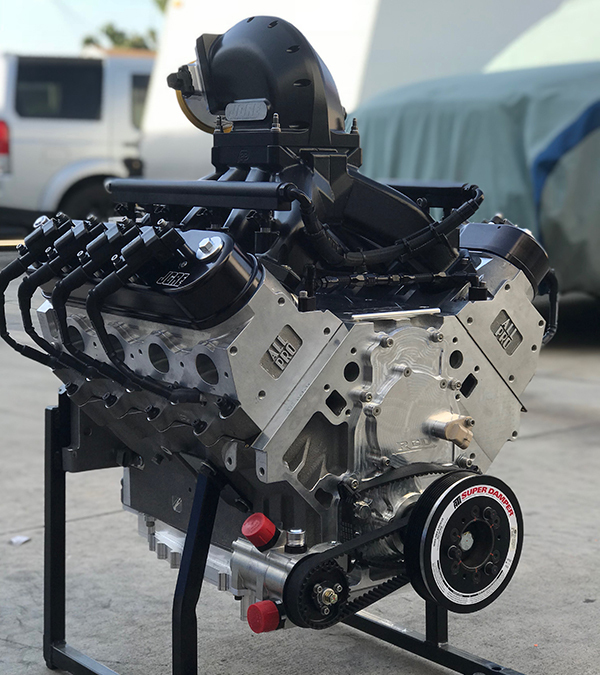 JGRE recently finished a big bore LS engine that features either a Dart or RHS block to start. For quite a few of the engines JGRE builds, the shop runs a gear drive that they jointly developed with a company by the name of RCD. 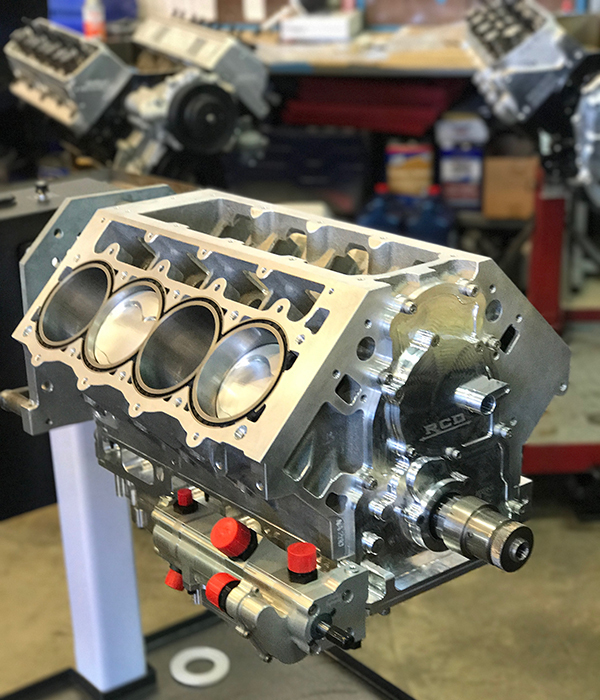 The oil pan and oil pump for the big bore LS are made by Dailey Engineering. The engine bearings are either King or Clevite and the gaskets are Cometic. 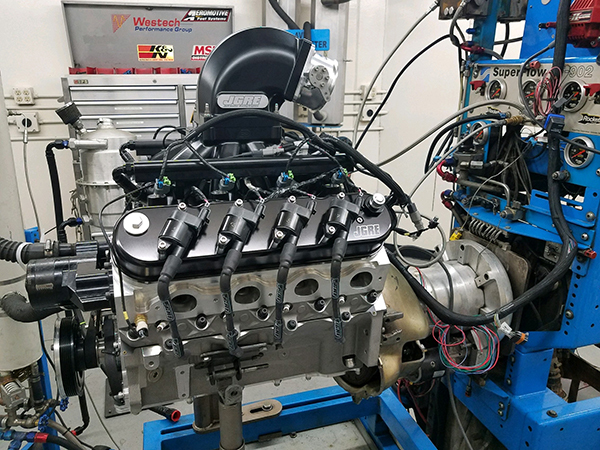 With all the machine work done, these big bore LS engines generally end up in the 454–465 cubic inch range. On race gas, normally aspirated, these engines put out right around 800 horsepower and north of 600 lb.-ft. of torque. Depending on the series and where the actual engine is going, the compression ratio is anywhere from 11.5:1 – 13.5-1. 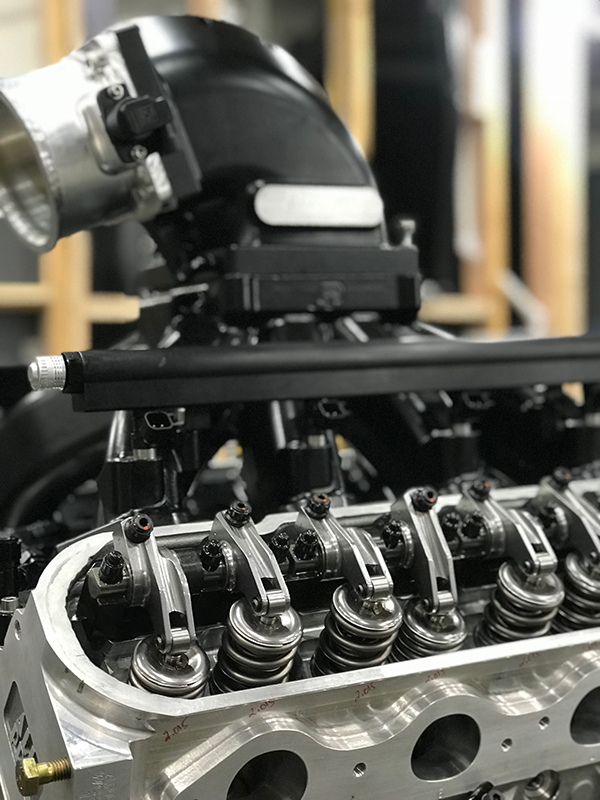 With JGRE’s attention to detail and expertise in engine building, this is one big bore LS engine that should have no problems navigating the ups and downs of endurance racing.